http://technologyfactory.blogspot.com/ » computer » What are Supercomputers Used for? From the essential and simple desktop to the ultra-sleek portable laptop and designated server machines, there are different types of computing machines used in various roles. Indeed the evolution of computers shows how a once complex and huge machine became a machine for the masses, a necessary part of every household and office. The earlier impression or idea of computers in people's minds was a very very smart, capable of doing anything machine, that could churn out data and information in minutes. But such "super" computers are not urban legends. They do exist and are in fact, called supercomputers. So what are supercomputers? They work on the principle of faster and more work done in minimum time. Supercomputers are capable of performing operations in minutes and seconds, that would take a team of even high-end machines, days or weeks or more realistically months to perform. They are also super in terms of maintenance and need large rooms all to themselves, along with extremely cool temperature surroundings. They consume a lot of power and have a very high processing speed and number of microprocessors for the brain. 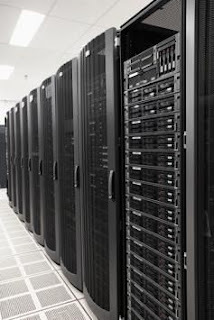 Supercomputers are used in situations, where a large amount of data needs to be processed in a small time span with rendering and modeling operations performed simultaneously. Supercomputers can be used to model or render the working of the nervous system or brain of an organism. In 2006, the École Polytechnique Fédérale de Lausanne of Switzerland used a supercomputer to render a part of a rat’s brain, to understand how neurons transmit and generate messages in this type of organism. This is not the complete brain, the computer was only capable of demonstrating the working of a small area. Nevertheless it was a breakthrough. In 2009, a joint venture by IBM and Stanford University modeled the cortex of a cat using the Blue Gene/IP supercomputer. They have simulated 1% of a human brain's functioning in the same year. Within the next 10 years, a complete rendering and simulation of how the human brain works will be shown by a supercomputer. Why model a brain? To understand how it works, how messages are transmitted, how are memories stored etc. Psychologists will be able to study why some mental conditions occur and which part of the brain is affected. The human brain is the most used part of the body but very little is known about it and bridging this gap, is a key job of supercomputers. Modeling the path and behavior of various celestial objects and bodies in space. Rendering the Sun, its functioning and its impact on the Earth. Supercomputers can help simulate supernova explosions, that occur in deep space and are out of monitoring reach. Simulation of how the Universe was created, by recreating and rendering the Big Bang event as well as how stars, dark matter and other space entities are formed. "As unpredictable as weather", is a common phrase but what if you could predict the weather? Or at least, identify warning signs and premature indicators? Supercomputers once again come to the rescue by rendering models and simulations as well as arranging numbers and data into useful statistics and graphs. Predicting the changes and fluctuations in weather patterns is possible through supercomputers. Cloud coverage and migration, analysis of the previous season's weather and comparison with the current situation, estimating the intensity and coverage of sunlight on Earth, analyzing the effect of pollutants on the atmosphere and weather and predicting ocean currents and temperature are just a few areas, that are explored and examined by supercomputers. The National Oceanic and Atmospheric Administration uses IBM manufactured supercomputers to aid in weather forecasting. The deadly impact of natural calamities and forces can be estimated and calculated in advance, to minimize damage. To a certain extent, supercomputers can predict the path or route of hurricanes, tornadoes and storms or tsunamis. This helps in carrying out evacuations and strong-holding of key resources. Seismic activity and calculating the possible paths of seismic waves can help in planning and learning how to handle such calamities. I. Supercomputers are used in solving complex equations such as in quantum physics and mechanics. II. With military aircraft and machinery, supercomputers can simulate aerodynamics at work and model flight patterns to aid in the development of better machinery. III. Nuclear research needs testing but instead of live detonations, supercomputers can help simulate nuclear explosions and reactions, that help advance the reach of nuclear technology. IV. Proteins are a very important biological component and their molecular structure is 3-dimensional in orientation. One fold or overlap of a molecular strand and the protein's working or function in the body can change. Diseases such as Alzheimer's and cystic fibrosis are linked to such folding of proteins, so understanding the nature of defective proteins and how normal proteins fold, is the key to learning why such diseases occur and how to cure them. Simulation of the folding operation of proteins is a very complex and computation filled task, once again a job for supercomputers. V. The flow of blood, its path and journey, speed and various difficulties that could occur, can be simulated with rendering done by a supercomputer. This is again of great medical use, as blood functioning in those blood disorders and illnesses can be compared with regular blood functioning to understand the complete spectrum of difference. VI. Supercomputers also aid research and studying in the fields of fluid dynamics and soil or deep inside the Earth's core exploration. They can also create complex animated models of molecular structures of various chemical and biological compounds and crystals. The above detailed uses of supercomputers demonstrate the usefulness of such machines in crucial tasks as well as aiding in discovery and carrying out research in various fields of knowledge. With each leap and bound taken by man in the arena of technology, today's supercomputer can easily end up as tomorrow's desktop! you're reading my article in my blog What are Supercomputers Used for? and you can find something What are Supercomputers Used for? ini dengan url http://technologyfactory.blogspot.com/2011/12/what-are-supercomputers-used-for.html, you can publish and copy paste for you What are Supercomputers Used for? it's very use full What are Supercomputers Used for? sumbernya.